This June marks the 48th anniversary of the Stonewall Inn riots, a series of demonstrations in response to a police raid at a Manhattan gay club. The riots are considered a pivotal turning point in the LGBTQ+ civil rights movement. Ever since the Stonewall Inn Riots, Pride Month has been a means for people to celebrate non-normative gender and sexual identities. Although, Pride Month is officially celebrated during the month of September in Champaign-Urbana, we can still commemorate locally by taking a moment to look back and retrace LGBTQ+ history at our campus. 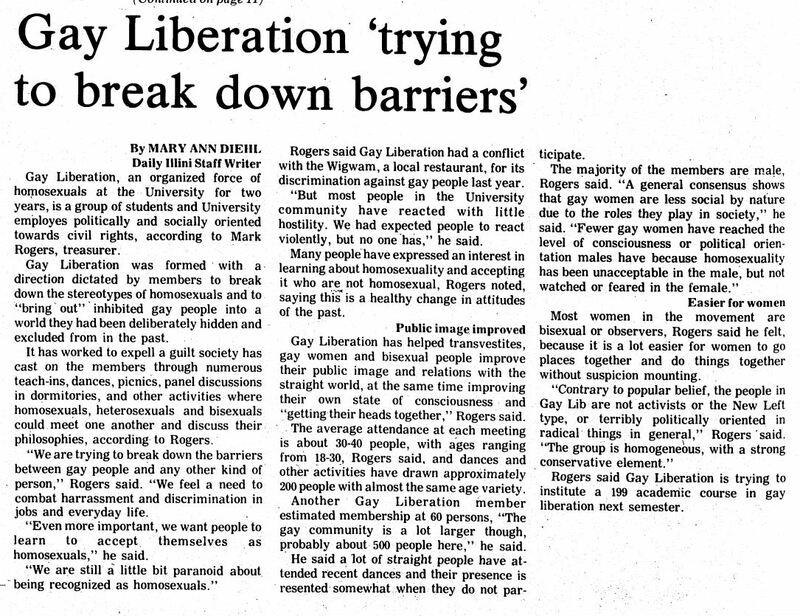 In 1971, the Gay Liberation Front at U of I was formed. In 1976 the Gay Switchboard as well as the Gay Illini Resource Center opened. 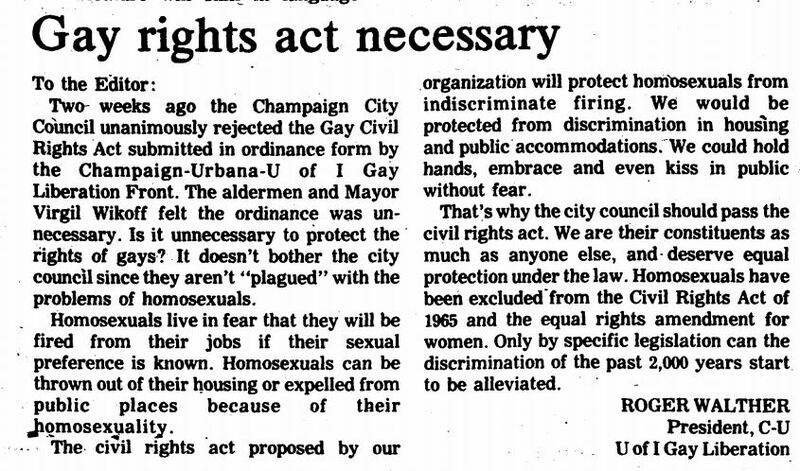 The following year, Champaign approved the Human Rights Ordinance, a historic win for the community. In 1986, the Chancellor conducted a campus-wide taskforce on Sexual Orientation, producing a report on campus climate. In 1987, the Board of Trustees passed a resolution to prohibit discrimination on the basis of sexuality. You can check out the full timeline on the LGBT Resource Center webpage. You can also look through issues of our school’s newspaper, the Daily Illini for primary source information. Entire issues have been digitized up to the year of 1975 and are available to browse online. 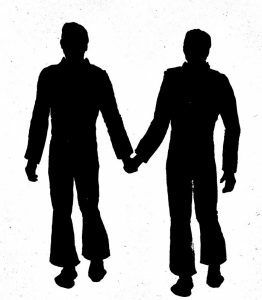 Select articles have been highlighted below to portray the historic realities of the campus atmosphere during the early 1970s, soon after the Stonewall Inn riots. Please note that when reviewing these or other primary sources, they are historical documents that may potentially contain content and/or language that today is considered offensive. The opinions and views expressed within these articles are solely those of the respective authors and/or their interview subjects. 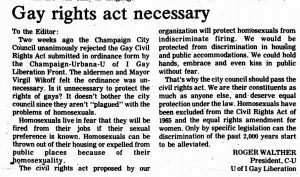 If you are interested in digging deeper into LGBTQ+ history in Champaign-Urbana, be sure to explore the LGBTQ+ Articles Archive. The library also has a lot of resources to both meet your research needs and to feed your general interest. For more information, be sure to check out the UGL’s Gender and Sexual Identity subject guide. The Social Sciences, Health, and Education Library (SSHEL) has a collection of resources in Lesbian, Gay, Bisexual, and Transgender studies. This guide includes detailed suggestions for databases, journals, websites for statistics and data, and other general information, including research tips. Looking for more resources? The Office of Inclusion and Intercultural Relations’ LGBT Resource Center and the University YMCA’s Uniting Pride Center are great community centers for LGBTQ+ resources. 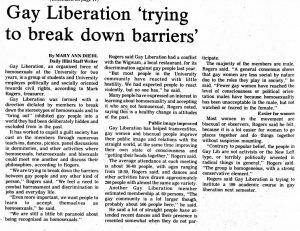 This entry was posted in Community, Uncategorized and tagged club ugl, daily illini, gay liberation front, gay rights, history, Illinois, LGBTQ, LGBTQ Pride, library, Pride, pride month, rainbow, stonewall riots, ugl, UIUC, undergraduate library, university of illinois at urbana champaign by AR. Bookmark the permalink.